I’ve been on a simplifying kick, lately. My disorganization finally got to me a couple of weeks ago. I needed to find a specific thing. This thing was very important to me. Actually, as a homeschooling mom, it was life and death level important because we didn’t get as much accomplished over the last school year as we should have and I really want to make sure that my kids succeed in life and know important things, like how to work basic arithmetic in a timely manner, and I had decided that we needed to focus on some math drills for a while in order to be really solid on multiplication facts before we move on. The thing I needed to find was going to fix all of our educational problems. At least, that was the way I felt at the time. I had a stack of bins full of school materials in the corner of my bedroom that was actually quite well organized when I stacked it there, but it had gotten buried beneath knitting books and bins of yarn. I took a deep breath, assuming that the thing I needed was in the top bin, which is where it should have been, and I unstacked ALL of the yarniness. I opened the top bin and what did I find? All of the math materials EXCEPT the thing. I went to the next bin. Did it contain the thing? Nope. I hauled every single bin – heavy, filled with textbooks bins – out to the dining room. I inspected each bin. Did I find the thing in any of the bins? No, I did not. It should have been there, but it wasn’t. Apparently, I hadn’t put it away because the bins were too difficult to get to, so I had a huge stack of school materials taking up space in my bedroom and it was all completely useless because I couldn’t get to it. That was when I kind of snapped. The kids stayed out of my way (mostly) while I spent the rest of the day on a cleaning and reorganizing rampage. I was so disgusted with the amount of stuff that I owned that was just in my way and kept me from finding the things that I actually wanted and needed because those things were hidden behind all of the junk that I wasn’t using. I cleared out my closet. I made everything fit into either my closet or my dresser. I got rid of yarn that I wasn’t going to ever use. I stacked all of my yarn stash on top of my bed, drove into town (15 miles away), dropped off donations and bought a 9-cube storage unit and 9 fabric baskets to fit the cubes. It really wasn’t too expensive, thank goodness. When I got home, the kids and I actually had fun assembling the new thing and then I spent the rest of the afternoon/evening organizing my yarn stash. All of my yarn came out of the bins and got sorted by weight and fiber content. It is absolutely wonderful! I found yarn that I had completely forgotten that I had and now, I can even get to it when I want it. I know which little basket each skein of yarn is in and I don’t have to spend an hour or two digging down through the bins to find anything anymore. The skeins that I am currently working with are in a neat basket on top of the cubes. It makes me smile just to think about it. 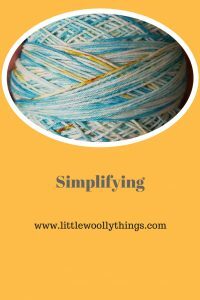 So, while I’m on this simplification kick, I have been working on cleaning up the Little Woolly Things layout to simplify it and make it easier for you to find what you are looking for. I hope you like the new look. I also have some big developments brewing in the background. There will be new patterns and video tutorials and SO much reorganizing! I’m very excited about all the things that I’m working on, but I am keeping my secrets – at least for a while. I’ll drop some hints as I get more of it actually built. In the meantime, have you seen my latest pattern release? 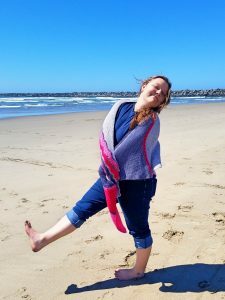 It’s the My New Best Friend Cowl, which is a companion pattern to the My New Best Friend Shawl. I used Arkansas Yarn Co. sport weight yarn that Lorri Ann custom dyed just for this project. 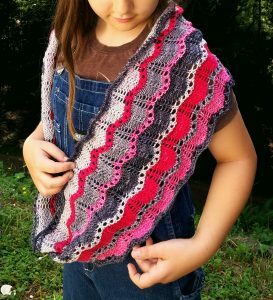 It was so much fun brainstorming the shawl pattern with her, getting the colors and the concept just right. Both of these patterns are great travel or TV knitting projects, which is especially nice for Summertime knitting. You can find buy now links for both of these on my Patterns page. If you want to post photos of your projects knitted with my patterns, use hashtag #littlewoollythings on Instagram and I just might repost them! Look out, World, here comes Joy!